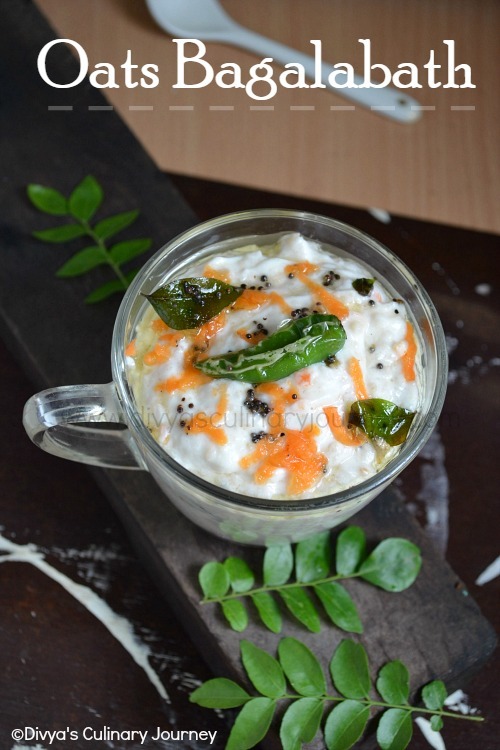 Today I am posting here recipe for Temple style Puliyodharai or Puliyogare that is offered in temple(kovil) as prasadam. This is also known as as Puli saadam/ Puli saadham. This is a simple rice made with tamarind. A thick tamarind mixture called puli kaichal is prepared then rice is mixed with it. My mom prepares this rice and I love it. But I have tried very few times at home. 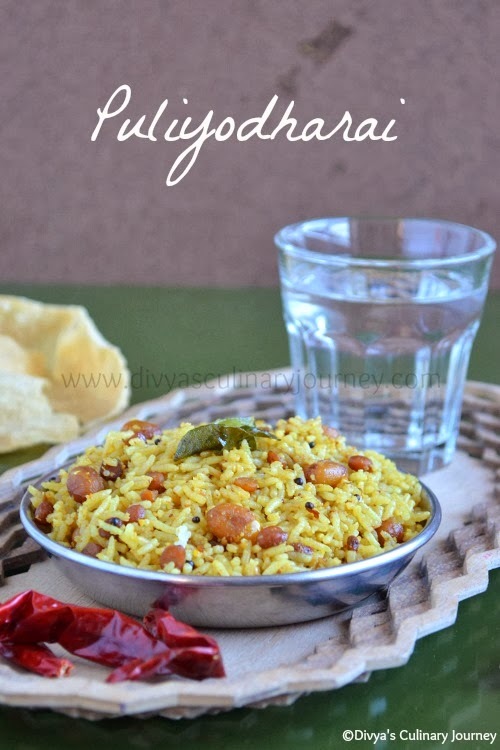 Few days back, I had sudden craving for tamarind rice and I started browsing for recipes and came across this recipe. I tried it and instantly fell in love with it. In this recipe , roasted powder is added but my mom doesn't use that but to get this rice taste like that one we get in the temple, then that powder is a must. The rice stays good for a long time so they are packed for picnics or long trips. Soak tamarind in warm water, extract the juice and discard the pulp. Heat a skillet,add sesame oil, add peanuts and roast them till they lightly change color then add mustard seeds and when they crack, add channa dal, urad dhal and fry for a minute or two, then add red chillies, curry leaves and fry for couple of more minutes.Then add asafoetida and turmeric powder and mix well and now add the extracted tamarind juice and mix well and cook till the extract thickens and oil starts separating. Then turn off the heat. In the mean time,prepare the powder. In a skillet heat oil, add channa dal, urad dal and roast for 2-3 minutes, then add coriander seeds and red chillies and roast for few more minutes, now add sesame seeds and fenugreek seeds, and roast in low heat till you hear sesame seeds sputter. Then turn off the heat. Let it cool and grind it into a coarse powder. Now to the rice add the required amount of puli kaichal, a teaspoon of oil, salt if needed and mix well gently without breaking the rice. Add roasted powder too as per your taste. Mix and let it rest for about 30 minutes and serve it. I served Puli saadham with appalam then finished the meal with Yogurt Rice. While making puli kaichal, take care when adding salt, as the extract thickens, the flavor concentrates and it may result in over-salting.Even while mixing it with rice salt can be adjusted. The amount of Puli Kaichal and roasted powder can be adjusted to your personal taste. Ordinary cooking oil can be used, but cooking with sesame oil enhances the flavor. looks really so good... awesome clicks! Puli saadham looks very delicious. Very delicious.. nice clicks..first time at your place.. and loving it..happy to follow you..
Puliyodharai looks delicious, drool worthy recipe ! 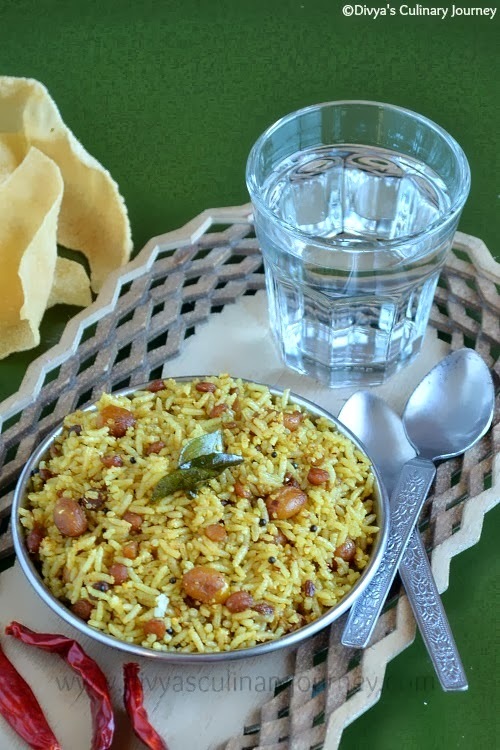 Never get bored of tamarind and lemon rice, my all time favourite rice dishes..Even i love with loads of peanuts in it. one of my fav recipe,looks inviting!! 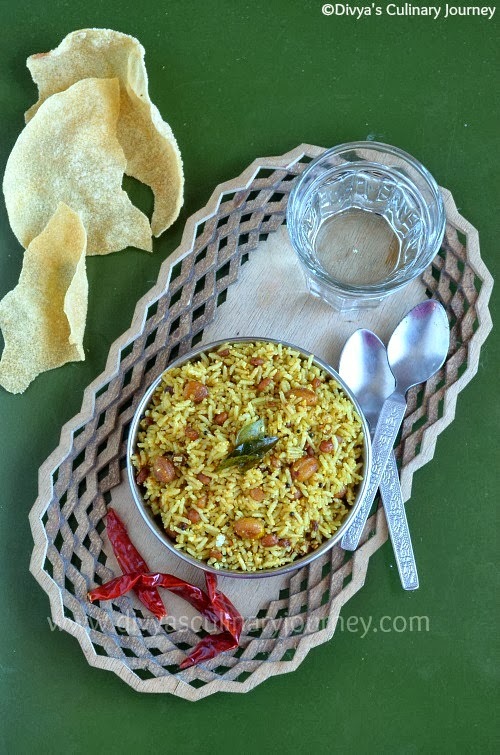 wow semma recipe... i love puliyotharai... tempting aks..
super recipe.. my son comes to temple only for this rice.. Very tasty! My all time favourite.. I love to eat it with curd.. Addition of peanuts is very tempting.. Love to have this tangy rice at any time.. I love this rice, coming soon to my space too. yours looks perfect. Amazing, love the recipe, and the clicks. This is how I use my leftover rice most of the time!